I'm delighted to be participating in the blog tour for author Katie L. Carroll's YA fantasy novel Elixir Bound. Katie shares some background on the extraordinary women in this story. Kylene, who died at the age of 16. I had hoped to give her a fantasy tale of her own. When it proved too hard to write the story from the POV of a character inspired by her, I decided to try from a different character's POV: her sister Katora's. This really changed the direction of the story. Where Kylene was sweet, sensitive, and wore her feelings on her sleeve, Katora was stubborn, independent, and also sensitive but would never want to show it. 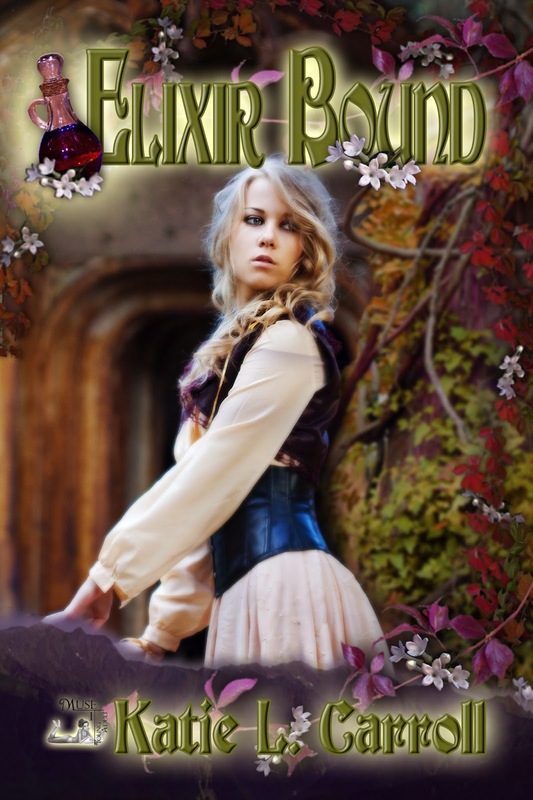 ELIXIR BOUND then became a story about a young woman (Katora) who must go on a quest to find out whether or not she will become guardian to a secret healing Elixir and bind herself to it. The binding part was key because it wouldn't allow to just use the Elixir as she wanted to; the binding would force her to use it in a way that also served the Great Mother (who is also called Mother Nature, and is basically the highest form of being in Katora's world). Now I had a story where a very independent character was forced to make a decision that would seriously hinder her independence and impact the path the rest of her life would take. This whole story line was a personal journey that was paralleled by a physical journey in which Katora and her companions had to find the secret ingredient for the Elixir. Notice the total lack of mention of a love interest. It was really important to me that Katora's motives for the quest had nothing to do with a boy. It was also important that Katora be chosen for this quest, not either of her two older sisters or her younger brother. I've always wondered why in so many real and fictional worlds the oldest son is the one who is entitled to the inheritance, so I wanted Katora to be neither the oldest nor a boy. The reason Katora was chosen as the next guardian of the Elixir, taking over for her father, was she was person who was best suited for the job. As I started writing ELIXIR BOUND, I realized I wanted these themes to be reflected in Katora's world as well. I think a lot of these themes spilled out of me unconsciously and only in revision did I become consciously aware of the feminism in them. Suddenly Katora's world had turned very pagan with the people following a female deity (the Great Mother) closely tied to nature. From there I sort of ran with the idea that females would, in a sense, rule this world. Though I kept it that Katora would take over for her father because I wanted some balance in the world. Women didn't need to rule everything. And Kylene was still there on the quest and plays an important role (though not the starring one). I wanted her there to contrast Katora's personality because there are other strong female characters besides the bulldozer type, which is kind of how I think of Katora. I needed a female who was strong in character but not in your face about it. Also, Zelenka, a member of the miniature demick species, was an interesting female character. In many ways very much like Katora, but also a bit of an adversary to Katora. They never quite get along, mostly because they are so alike. There does end up being a love interest on the quest. One I had to emphasize and play up more as I went through revisions because several of my early readers didn't think it played a big enough role. Katora initially resists forming a relationship with Hirsten, the handsome son of a famous mapmaker. She doesn't want anything to distract her while on her mission and while she has such an important decision to make. Though the quest part of the story is not driven by romance, Katora's ability to realize her capacity for love (and in turn why she has resisted her feelings for Hirsten) does play into her decision on whether or not to become guardian of the Elixir. As you can see, I thought a lot about the role of females in the made-up world of ELIXIR BOUND as I was writing it. I'd like to think my story offers a feministic look at females and hopefully speaks to teenage girls in a positive way. Although, I didn't want to force any certain didactic message about feminism in the story...more an offering of female characters and how they take control of their lives and futures. Themes I certainly plan on considering while writing future works as well. Katora Kase is next in line to take over as guardian to a secret and powerful healing Elixir. Now she must journey into the wilds of Faway Forest to find the ingredient that gives the Elixir its potency. Even though she has her sister and brother, an old family friend, and the handsome son of a mapmaker as companions, she feels alone. It is her decision alone whether or not to bind herself to the Elixir to serve and protect it until it chooses a new guardian. The forest hosts many dangers, including wicked beings that will stop at nothing to gain power, but the biggest danger Katora may face is whether or not to open up her heart to love. Enter the Goodreads giveaway for a signed paperback copy until September 28. Learn more about Katie L. Carroll on her website, on Twitter (@KatieLCarroll) or Tumblr. One of the greatest challenges facing a historical novelist is choosing what information to use from a sea of research. But just as tricky is wanting to find out about a historical event or place and discovering that almost nothing is known about it for sure. Kim Rendfeld dealt with both of these situations as she wrote her latest novel. What Was the Real Pillar of Heaven? The title for The Ashes of Heaven’s Pillar is derived from the Irminsul, a pillar sacred to the Continental Saxon peoples, including my heroine, Leova. The one thing we know with certainty: Charlemagne ordered its destruction in 772 and took the gold and silver in its temple. The nature and location of the Irminsul is uncertain—as is whether it was the only one. Some sources say it was a stone pillar, others say wooden pillar, and still others say it was a tree. It’s been described as having an idol of the war god atop it. Because of the presence of a carving, some have placed it at the Externsteine, north of the Saxon fortress Eresburg. We can’t turn to the pagan Saxons for any clarity. They did not have a written language as we know it, and the Church did everything it could to obliterate a religion it considered devil worship. So what’s a historical novelist to do with so many contradictions? Choose the most plausible version that best fits her story and confess her liberties in an author’s note. Or a blog post. My first liberty is to call the Irminsul the Pillar of Heaven. Irminsul is often translated as “universal pillar.” I chose Pillar of Heaven in my novel because frankly it sounds better. And Wodan, the war god whose idol might have surmounted the pillar, was a sky god, so the Pillar of Heaven is not too much of a stretch. Next was the location. Leova lives in a village just outside the fortress of Eresburg. Having it nearby allowed her to smell the smoke when it burned and see the charred blotch it left behind. It made the loss more real and more devastating. Flames are a dramatic form of destruction, which is why I decided the pillar should be made of wood. To the Continental Saxons, the Irminsul’s destruction was the equivalent of burning a cathedral. Did the Saxons believe anyone who desecrated their sacred monument would face the gods’ wrath? Again, there is no text to verify it. But this was age that believed in divine favor and retribution, so that idea passes the plausibility test. From a storyteller’s point of view, actual facts about the Irminsul are not as important as its impact on the characters. And in this case, Leova’s faith is shaken, as you will see in the excerpt below. By his accent, Leova knew the priest was a Saxon from Britain, like many of the other priests who had come to her village. They were mild men bearing treats for the children along with the teachings of their odd religion. From the corner of her eye, Leova saw Wulfgar and Ludgar shrinking back. Perhaps, the Christian God was stronger than the gods of the Saxons. “We will give safe conduct to Eresburg to anyone who promises to accept baptism,” Osbald continued. Osbald spoke Saxon, but Leova could not understand half of what he was saying. From the confidence in his voice, Leova surmised the Christian God had given His priests magic power, enough to cow warriors into submission. How she needed safe conduct to the fortress—and Derwine! “What is baptism?” Leova asked. “You vow to follow Christ, forsaking your devils, and He cleanses you of your sins,” the priest replied. “Do we have to shave our hair in that strange way?” Sunwynn asked. Baptism appealed to Leova. She suspected the conquerors would be more generous with those who shared their religion. Maybe it was fate to follow a stronger God. 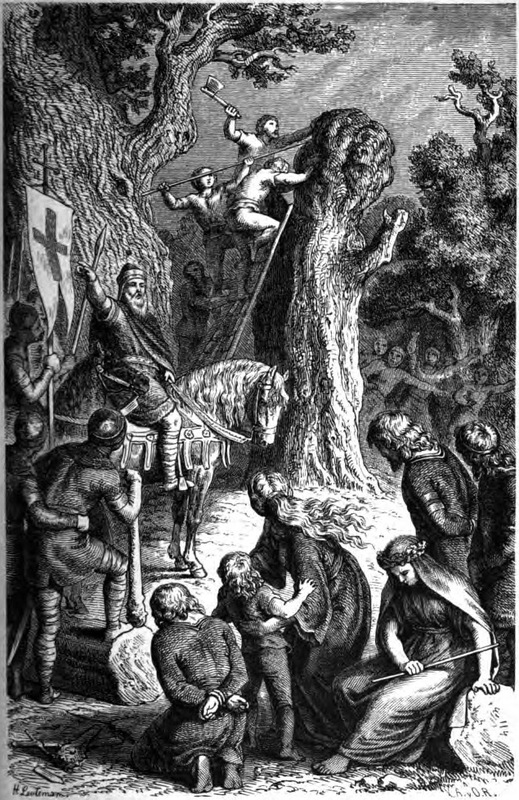 The Saxon gods had allowed the Irminsul to be destroyed, Leodwulf and Derwine to die, and Eresburg to be conquered by foreigners. Despite her sacrifices and prayers, the Saxon gods had betrayed her and her family! To read the first chapter or find out more about Kim Renfield, visit her website, her blog Outtakes of a Historical Novelist, or like her on Facebook and follow her on Twitter at @kimrendfeld. 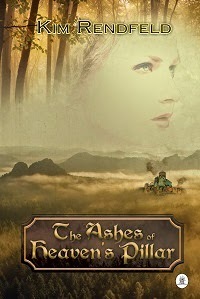 You can purchase The Ashes of Heaven's Pillar at Amazon and Barnes & Noble and elsewhere. Some of the greatest speculative fiction contains serious analysis of very real, contemporary human problems, offered up with a magical or surreal twist. 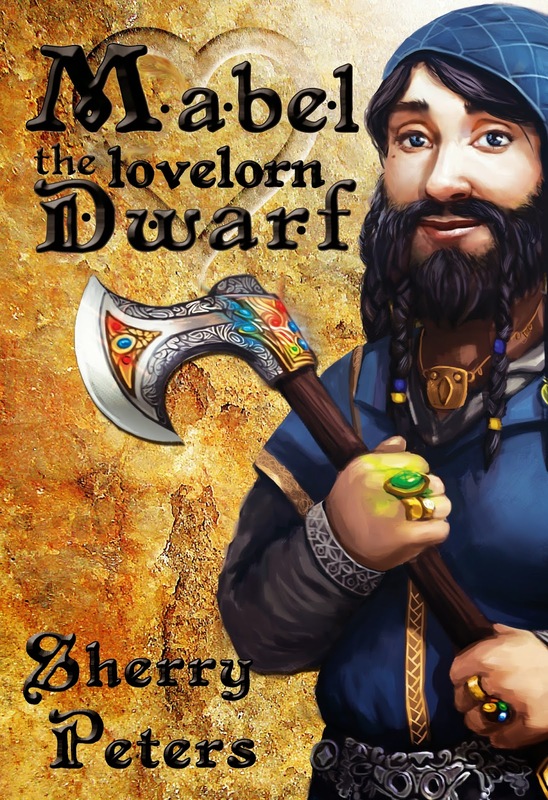 My guest, Sherry Peters, tells just such a parable in her novel Mabel the Lovelorn Dwarf. I want to thank Anne for giving me this opportunity to share with you the origins of my new novel Mabel the Lovelorn Dwarf. Sophia Vargara was put on a pedastal during the most recent Emmy broadcast so that the audience had something (the president of the Television Academy did say something, not someone) intriguing to look at. Our young girls are under growing pressure to sext their boyfriends or even boys they like in hopes of getting some kind of attention. Teens are committing suicide after relentless bullying because they are gay, or overweight, or different. Many of us feel like we need to do and exceptional and perfect and if we aren't, no one could possibly love us. These kinds of pressures have always existed. They seem to have multiplied and intensified in the last number of years. Even as there is a growing emphasis on tolerance, there seems to be a polarization toward increased discrimination. And that polarization, that increased pressure, upsets me. I'm a big believer in story being a way to look differently at important social and political issues. When I started writing about Mabel the Lovelorn Dwarf, I spent a lot of time thinking about what life would be like as a female dwarf. The more I thought about it, the more the social issues became clear. I also saw how I could shed a new light on those issues while using humor. I wanted to write a story where the main character has a happy ending, but it isn't in finding love or losing weight or getting the promotion at work. I wanted the happy ending to come from within--from self-acceptance and self-love. I started with the tropes that I'd seen in so much epic Fantasy, both in books and the movies, like the ever-present enchanting female elf, the female dwarves with beards, mining gems of all sorts from one mountain, and I played with them, turned them around or exaggerated them. I used them to my advantage and created the perfect world for a character who didn't fit in. In Mabel the Lovelorn Dwarf, females make up less than a third of the population. They are the ones responsible for procreation. But just like the rest of us, they have to look a certain way too, they need to be stout and they need to have full beards. So what if Mabel decided she didn't want a life-mate or to have dwarflings? What if she wasn't as stout or her beard wasn't as thick as was considered attractive? She's stuck trying desperately to conform to what her family and community expects of her, knowing that her true happiness and finding the place she belongs, lies somewhere else. No spoilers, but there comes a point where she has to choose. I've just released Mabel, and so far reception has been positive. My hope is that at least one person who reads Mabel is given hope that there are others out there like them, who don't conform to society's standards, that they are wonderful and deserving of love--be it from family and friends or a significant someone--and happiness, just as they are. My hope is that at least one girl who reads Mabel stops pressuring herself to starve herself to look a certain way, or to sext a boy just to feel acceptable. My hope is that our young people and adults alike, will accept themselves and find others who accept them for who they are, regardless of appearance, profession, or any number of social constructs we use to discriminate against. You can learn more about Sherry Peters on her website, on Facebook, and on Twitter. You can purchase Mabel the Lovelorn Dwarf on Amazon, Barnes & Noble, and elsewhere. "I'd like to write an adventure for Vinny the armadillo," I say to Daughter of her new plush toy. We are in the car, driving home from her grandmother's house. "What should I write?" Daughter, who is six, says with enthusiasm, "He can go to the sea! And meet a shark! And the shark can eat him!" "But if a shark eats him, there won't be any more stories!" I say. "Besides, I'd like him to learn something in these books. How not to be eaten by sharks isn't a lesson most children need to learn." "How about Vinny climbs a telephone pole and can't get down!" "All right," I say, trying to work with this. "Then what happens?" "And then he falls down and dies!" she finishes gleefully. "That's a horrible ending!" I say, and she's already giggling, so I start laughing too. "Besides, what's the message there?" "You shouldn't climb up places you can't climb down from." I can't disagree with this, but I find myself explaining the concept of reader expectations, and what will happen to Mommy if she writes a book for first-graders that involves the hospitalization of armadillos after all the appalled parents find Mommy's email address. Later, I am working on art for Vinny the Armadillo Makes a Friend when she finds me at the kitchen table. I decide to apply for her opinion. "Do you think I should put the unicorn on the cover, or would that spoil the surprise?" "I think it would spoil the surprise," Daughter says. "Besides, if you put a unicorn on the cover, boys won't read it." "What?" I say, startled into looking up from my sketchbook. "Boys don't like unicorns," says Daughter firmly. "They think they're too girly." "Even my unicorns?" I say. "My unicorns live in swamps! They have gnarled old horns like the roots of mangrove trees! Moss grows in their manes!" "Boys won't buy it. Sorry, Mommy," she tells me, and pats me on the shoulder sympathetically before skipping off to play. Of all the things I anticipated when deciding to write a chapter book, the one thing I didn't was how much fun my daughter would have walking through the process with me. I normally write for adults—science fiction and fantasy novels and business nonfiction—a process that she knows only as "Mommy stands at a computer and says she's working." For the first time, I was able to expose the inner workings of Mommy's job to her in a way that allowed her to participate. I was surprised at her enthusiasm during every stage of the book's creation, even for the strange minutia, like checking the galleys and making decisions about margin size and font choice. When I finally handed her the Real Live Book, she was as excited as if we'd performed magic. From the intangible discussion we'd had in the car about her new stuffed animal, we'd created a physical object her friends could now buy from the bookstore. Self-publishing a chapter book was probably not the wisest financial decision I've ever made. Selling children's fiction without traditional publishing's conduits into school and library systems is (at this point) a near non-starter. But getting to hear my daughter's ideas on story, art, and marketing, and seeing the excitement in her eyes when she paged through the final copy, was worth it. Vinny the Armadillo, and my Laundry Dragons, might never make us more than a little grocery money, but we'll both be able to say, one day, "We did that together." Learn more about Maggie Hogarth on her website. Purchase Vinny the Armadillo and the Laundry Dragons books on Amazon and Barnes & Noble.